I’ve been slow to post this week because I’ve been writing, writing, writing. Hopefully, I’ll finish what I’m working on soon! 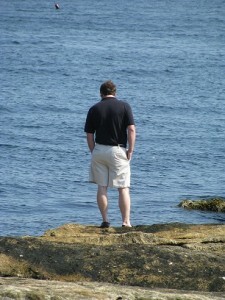 So, I’ve mentioned MH (the husband) and I wanted to post this picture from our trip to Maine. I really love it. It’s so him. Okay, I know it’s his back, but it’s still a pretty nice view. 😉 He was looking at the rocks.